The items in this category are carved wood fish decoys used by Ice Fishermen to lure and and spear sport fish. Primarily from Minnesota, Michigan and Wisconsin. Exceptional, large carved wood loon ice fishing spearing decoy (11 1/2 inches) long with dangling tin feet. Wonderfully carved and painted with great detail. A rare and fine example of Ice Fishing Folk Art. From an Oklahoma collection. A very well carved and paint decorated Brook Trout Ice Fishing Spearing Decoy, 8 3/4″ long. More detail given to the paint colors and details. Fine original condition and attractive aged patina. from a Minnesota collection. Extremely unusual flying e wood pecker ice fishing spearing decoy, 8 1/2″ long. 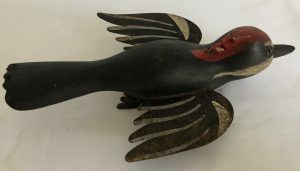 Beautiful piece of American Folk Art – terrific wood carving, cut out tin wings and dangling feet and a realistically painted body. An exceptional example. From an Oklahoma collection. Exceptional catfish ice fishing spearing decoy, 7 1/2″ long. Excellent fin and paint details with good wire whiskers. From an old Oklahoma collection. Fine original condition. 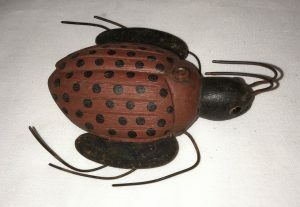 A most unusual Cardinal ice fishing spearing decoy, 6 1/2″ long. 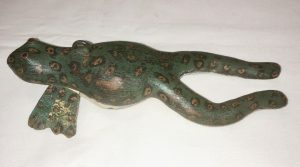 Overall wonderful piece of American Folk Art – great form in the carving, tin wings and dangling feet. Wonderful original paint. A rare form. From an Oklahoma collection.